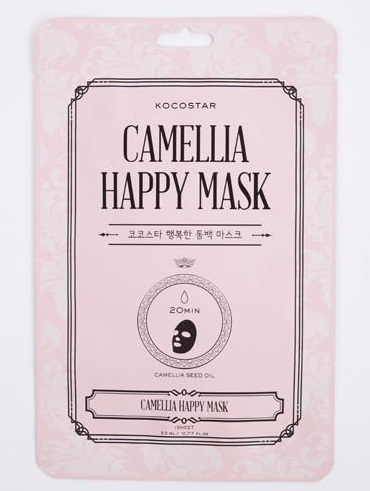 Kocostar USA's Camellia Happy Mask is made of special rayon fiber infused with premium red camellia seed oil. The result is a soft and silky sheet with natural pink tint! It gently adheres to the skin without irritation and blends beautifully with skin tone for enjoyable skincare. This mask holds moisture far better than regular cotton or non-woven fabric and remains moist for several days even after being exposed to the open air. Also the sheet has excellent antibacterial properties and inhibits the growth of acne bacteria. This special sheet is soaked in herbal essences and camellia flower extract for an intense soothing and moisturizing treatment. Rich in oleic acid, niaouli oil, and cypress oil, the botanicals will form a skin friendly, protective barrier to soothe dry, troubled, and sensitive skin. 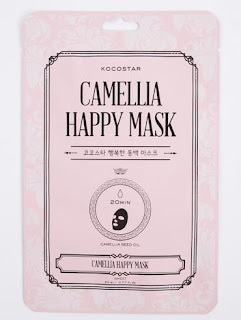 Retain moisture and restore natural luster with the Camellia Happy Mask! This beautiful floral pink mask will be your must have-item once you try it! After one use, this will be your go-to mask. 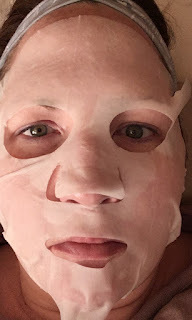 The camellia sheet mask is different from all the other masks you have used before because it doesn’t get dry! You’ll be left with moist and happy skin. After using skin feels soft, moisturized, hydrated, soothed and definitely looks better than prior to using. I love the way it makes my skin look better than prior to using. The effects definitely stay for a couple of days too. So that you look better and definitely feel better about your skin too. Even 3 days after use, the skin's moisture level stays at about 40% higher than it had previously. That is pretty good compared to no moisture level in the skin. Kocostar Camellia Face Mask can be purchased on www.kocostarusa.com. Like Kocostar on Facebook: https://www.facebook.com/kocostarusa/; Follow Kocostar on Pinterest: https://www.pinterest.com/kocostar/ and Follow Kocostar on Instagram: https://www.instagram.com/kocostarusa/. Spending money at the salon is such a fail. Have a salon experience right at home.